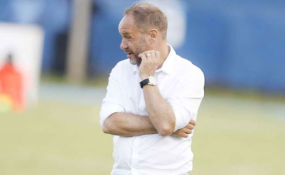 Harambee Stars coach Sebastian Migne has opened the door for Cliff Nyakeya and Duke Abuya to stake a claim in his final team ahead of the 2019 Africa Cup of Nations in Egypt in June. The French trainer is also keen to try out Sweden-based Christopher Mbamba and Crawley Town defender David Sessay, naming them in his 29-man squad set to face Ghana in the final 2019 Africa Cup of Nations qualification match. This contest is set for the dreaded Baba Yara Stadium in Kumasi on March 23. Nyakeya and Abuke are arguably the most promising players in the SportPesa Premier League at the moment. A fast paced and skillful forward with an eye for goal, Nyakeya's five goals so far this season place him among the top scorers in the league. Similarly, Abuya has transformed into a reliable attacking minded player for Kariobangi Sharks. The 25-year old's recent prominent contribution includes scoring twice for Kariobangi Sharks in that memorable win over Tanzania's Young Africans at a packed National Stadium in Dar es Salaam during the SportPesa Cup tournament. "It (playing against Ghana) is a chance of a lifetime," explained Nyakeya. "I will seize it (the chance) and try to score goals like I have been doing in the league. I will not discuss the Nations Cup tournament for now." 26-year old Bamba was born to a Namibian father and Kenyan mother in Zimbabwe and currently turns out as an attacking midfielder or winger for Sweden's second tier side Oskarshamna AIK. He has represented Sweden at the U-17 and U-20 level. "I feel honored. It’s the greatest privilege in football to be able to represent your home country and I’m very much looking forward to touching the ground with my fellow Kenyans. The chats I’ve had with the Kenyan base have given me nothing but good vibes and I’m happy. At the international level, it’s always going to be good competition, but that’s what we live for," he told Nation Sport. Also called up is captain Victor Wanyama who returns to the squad despite consistent injuries which have reduced on his playing time at Tottenham Hotspur this season. Japan-based Micheal Olunga and Zambian trio of David Owino, Musa Mohammed and Anthony Akumu have also been invited. Notable absentees include the injured Ayub Timbe, in-form Jesse Were and David 'Cheche' Ochieng who currently is unattached. This is the final competitive match for Harambee Stars before the Nations Cup and a win or draw will guarantee top spot in Group 'F'.